"Its first ingredient is real chicken, but it also includes vegetables." "It’s a great source of nutrition in a convenient single-serving container." "Features salmon as its first ingredient, while peas and carrots deliver fiber." "Specifically formulated for puppies with a recipe that supports strong bones." "It’s made only with easy-to-digest ingredients like chicken and peas." "Formulated for dogs under 25 pounds and free of preservatives." "Made with ingredients that contribute to joint health." "Free of artificial flavors, preservatives, and animal by-products." Finding a great dry food for your dog can be surprisingly tricky. Many of them include meat and poultry by-products and artificial flavors, colors and preservatives—none of which are ideal for your pup’s diet. 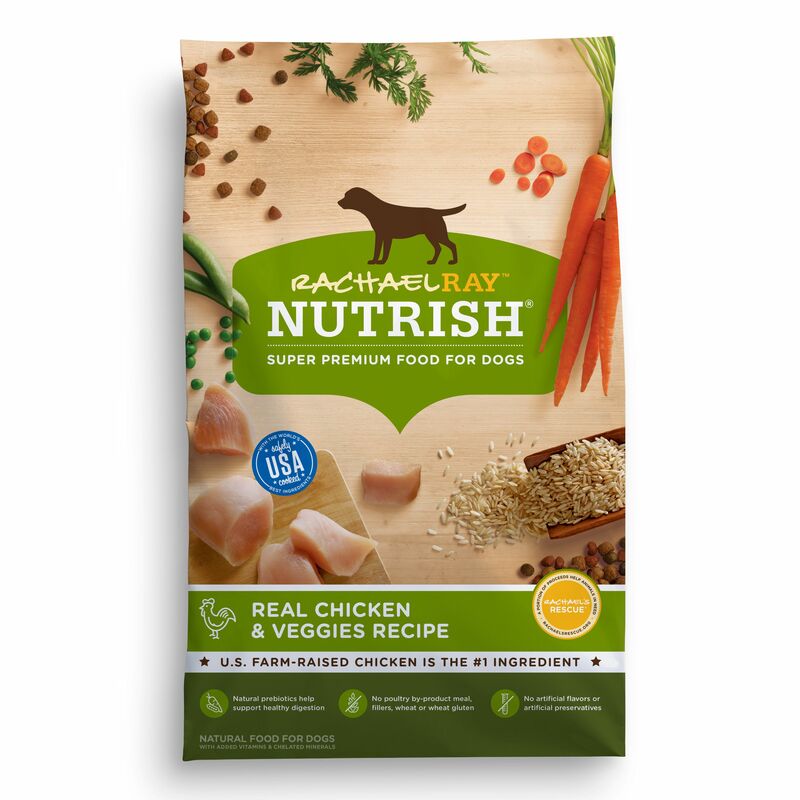 We love Rachael Ray’s Nutrish brand—yes, she makes food for dogs too—because its first ingredient is real chicken, and it also includes a variety of vegetables and added vitamins. Free of artificial flavors and preservatives (as well as by-products of any kind), it’s earned rave reviews from customers who say it sends their dog into their “happy dance” every time. The recipe is made for dogs of all sizes and consists of 26% protein, 14% fat, 4% fiber and 10% moisture. The ingredients also feature natural prebiotics to aid with digestion, making it a good pick for dogs with sensitive stomachs. Our pick for wet food does double-duty: It can either be used as a food topper with kibble to encourage picky eaters or serve as a meal unto itself. Made with real chicken, vegetables and whole grains in a savory sauce, it’s a great source of nutrition in a convenient single-serving container. It’s made up of 9% protein, 2% fat, 1.5% fiber and 82% moisture, and sold in packs of three. When using it as a topper, bear in mind that one can replaces approximately 1/4 cup of kibble. 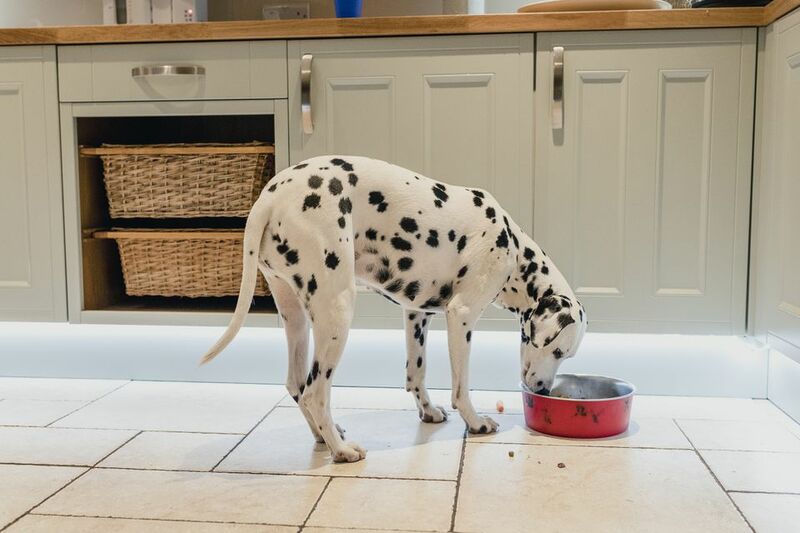 Customers have had great success using Purina Beneful Medleys to get their choosy dogs excited about mealtime—if you have one of those dogs that only wants to eat treats, this is one way to potentially reduce your stress over feeding. Reviewers have also noted reduced gas and upset stomachs for dogs who struggle with digestion issues. True to its description, grain-free foods do away with the cereal grains commonly used in other types of dog food. Since some dogs struggle to digest these ingredients, a grain-free diet is a simple way to cut to get them the nutrition they need without the bits that result in upset stomachs or itchy skin. Pure Balance Grain-Free food features salmon as its first ingredient, while peas and carrots deliver fiber and beta-carotene. Most importantly, the recipe is entirely free of corn, wheat and soy. Customers say they wish they’d discovered Pure Balance’s grain-free dog food earlier, noting that their dogs’ coats are shinier, their stomachs are settled and their skin is itch-free. The food is high protein at 24%, and also consists of 15% fat, 5% fiber and 10% moisture. Puppies have different dietary needs from fully-grown dogs. Puppy food should be higher in calories than adult food to compensate for their higher energy levels and support tissue growth and development. Purina Puppy Chow is specifically formulated for puppies, with a recipe that supports strong bones and teeth while building muscle. The food is 27% protein, 12% fat, 5% fiber and 12% moisture. It includes all of the essential vitamins and minerals as well as DHA, an omega-3 fatty acid that aids with brain development. Customers call Purina Puppy Chow “unbeatable,” and say it provides the nutritional support their dogs need as they grow. It’s also a fairly affordable option. At their vet’s recommendation, some owners also use it with older dogs who need some extra help reaching a healthy weight. Think of it as the dog equivalent of Ensure. Food allergies are no fun. For your pup, sensitivities to certain ingredients or processed foods can result in ear infections, stomach issues, and itchy, uncomfortable skin. If you’ve noticed your dog suffering from these symptoms, try transitioning him to a sensitive skin and stomach recipe like this one from Iams. It’s made only with easy-to-digest ingredients like chicken (the first ingredient here), peas and beet pulp. It’s also grain-free and doesn’t include fillers like poultry by-products. Meanwhile, the texture of the food works to give your dog’s teeth a scrub, and the inclusion of Omega 6 and 3 fatty acids help to keep their coat shiny and their skin itch-free. The food consists of 24% protein, 14% fat, 4% fiber, and 10% moisture. Reviewers say it’s also great for gas issues, and that they’ve successfully used it as a less expensive alternative to prescription dog food. Small breeds have faster metabolisms than larger breeds, so their dietary needs are slightly different. Unsurprisingly, they also do much better with small-bite foods they can easily chomp down. Nature’s Recipe small breed food is another grain-free, easy-to-digest offering, featuring real chicken and nutrient-rich sweet potatoes. Formulated for dogs under 25 pounds, it’s free of artificial flavors and preservatives and tiny enough for smaller mouths. The food is 25% protein, 15% fat, 4% fiber and 10% moisture, and also features minerals like copper and zinc to promote healthy skin and coat. Customers say Nature’s Recipe small breed food is a winner even with picky eaters, with the added benefits of being both affordable and healthy. How about the needs of larger breeds? Big dogs need to be fed a diet that promotes strong muscles and healthy joints, helping to relieve some of the common issues they experience as they age. Nutro Wholesome Essentials is made with ingredients that serve as natural sources of glucosamine and chondroitin, nutrients that contribute to joint health, and also includes antioxidants like vitamin E to support their immune system. The first ingredient is chicken, and the recipe also features brown rice and sweet potato. Consisting of 21% protein, 13% fat, 3.5% fiber, and 10% moisture, Nutro Wholesome Essentials offers a complete and healthy meal for large breeds. While it’s on the expensive side, customers say the natural-ingredient recipe is ideal for their labs and Great Danes, who can experience bloat when they eat foods that aren’t as protein-forward and feature additional fillers. Treats don’t have to be an unhealthy splurge. In fact, there are plenty of options out there that are made with the same whole-ingredient of the best dog foods. These treats from Nudges feature real chicken as the first ingredient—they’re protein-packed and full of nutrients for strong bones and healthy joints. They’re also free of artificial flavors, preservatives, and animal by-products, so you can give your dog a guilt-free treat.